COLFAX FLUID HANDLING, a business of Colfax Corporation reports it introduced and demonstrated the latest version of its Smart Technology CM-1000 Series smart controller for seawater cooling systems at Nor-Shipping in Oslo, Norway. 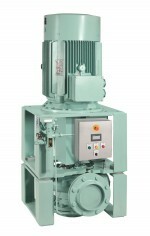 The company says the CM-1000 adjusts the flow rate of sea water pumps based on the temperature of the ship's fresh water and current cooling requirements, thereby saving significant energy. New features include turnkey and ready-to-install solutions, sending of monitored parameters to Windows PCs, optional exclusion of a standby pump, complete shutdown of the pumps, and monitoring of the status of the cooling system. Designed to help maximise shipboard pumping efficiency, the CM-1000 Series can assist in reducing operating costs while maximising uptime. Application of the CM-1000 Series to sea water cooling systems has demonstrated energy cost savings of up to 85% and sea water pump maintenance costs by up to 50%. In addition to exclusive valve control, new functions and installation options were on display at Nor-Shipping.